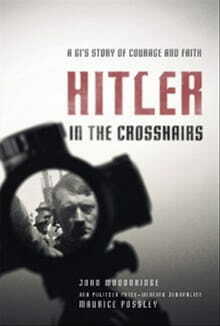 EDITOR’S NOTE: The following is an excerpt from Hitler in the Crosshairs by Maurice Possley & John Woodbridge (Zondervan). The name echoed through the auditorium at Mount Vernon High School, and a young man rose from his chair in the third row and strode toward the stage wearing the wide, toothy grin that had long disarmed and charmed family and friends in this New York town less than twenty miles north of Manhattan. Ever the athlete, he moved fluidly and confidently on this June evening in 1932. Still, he fought a ripple of unease. He knew that his academic record over the past four years was spotty at best, and he was not prepared to fully relax until Principal Hugh Stewart placed his diploma in his hand. For reasons that would ever remain a mystery, Palm’s diploma bore the middle name of his older brother, Clifton, and not his true middle name, Arterburn. But over the years, he had made clear that he was not all that fond of the name Arterburn in the first place. Arterburn was his mother’s maiden name and came from a long line of pioneers who settled originally in the Shenandoah Valley of Virginia. Some of their descendants had loaded their possessions onto a flatboat and floated down the Ohio River until reaching the banks of Beargrass Creek in Louisville. There the Arterburn family settled in St. Matthews, Kentucky, in the late eighteenth century. Over the next decades, the Arterburns established successful careers and excellent reputations as farmers, horsemen, bankers, and civic leaders. They attended colleges, including Yale. At one time, the family estate consisted of more than one thousand acres and by the mid-1850s, the Arterburns were living a life of comfort and ease, aided by resident slave families who took care of the household chores, attended to the needs of the children, cooked, raised crops, and managed the livestock. Slavery was a big business in Kentucky at that time, and Louisville was the launching point for thousands of men and women to be shipped to large plantations farther south. While awaiting buyers, slaves were shackled together in pens at the four large slave markets operating there, including one owned by the Arterburns. It is impossible to know how heavily the stigma of slave trading hung over the family, but by the time Palm received his diploma, it had been erased from the name Arterburn. His mother, Susan, had been born in 1889, third of the eight children of Clifton C. and Georgia Arterburn, all of them living in a stately, two-story home surrounded by six hundred crab apple trees just outside Louisville. Clifton, or C.C. as he was commonly known, was a horse breeder and sportsman who regularly traveled to Indiana and other states to race trotters. Sadly, his other passionate pursuits were heavy drinking and gambling, and as the twentieth century neared, the family reaped the sorrows of his bad habits: the farm and virtually every stick of furniture in the house had to be sold to pay off debts. When a friend offered him a railroad job, the family moved to Mount Vernon, then a burgeoning town of twenty-one thousand whose growth was fueled by New York City residents fleeing the rising cost of living. The family had barely established a toehold there when, in brutal back-to-back fashion, Susan lost both of her parents. She was fifteen when her mother died after a short illness in 1905; the following year she lost her father when, drunk, C.C. toppled from a train platform and died under the wheels of a passing locomotive. In 1907, eighteen-year-old Susan met twenty-six-year-old Fred Palm at a dance sponsored by the Mount Vernon Fire Department. A native of New York City, Fred was one of eight children and worked as a Mount Vernon firefighter, as did his father and one of his brothers. He and Susan married in November of that year, and though Susan was a Presbyterian, she consented to be married by a Catholic priest because Fred had been raised a Roman Catholic. Their first child, Gladys, was born in 1909. The second, Clifton, arrived two years later, and Ira was born January 11, 1913. He weighed barely six pounds at birth, and family members and other relatives so frequently remarked on how “teeny” he was that he was dubbed “Teen,” a nickname that stayed with him his whole life. The family’s last child, Doris, was born in 1927. They lived in a three-story frame home that was alive with activity during Teen’s early years. Rooms on the top floor were rented out to college students, as well as to young men trying to launch their careers and the occasional relative who had fallen on hard times. These tenants, known collectively as “the boys,” frequently joined the family for dinners and participated in animated discussions and played cards in the living room. During the holidays, the dining room table groaned under the weight of plates and cutlery and food for as many as twenty family members, tenants, and friends. Afterward, as the adults conversed about politics, sports, and other news of the day, Teen would slip away either to play with the other children or find some sort of mischief. The front door of the home opened onto an entrance hall and a staircase with a wooden banister. The only telephone in the house stood sentinel-like on a table. There were two connected living rooms, one dominated by a piano, where the family often gathered to sing whenever Gladys played. The rear living room, with its fireplace, was Fred’s cozy retreat. He could often be found there, sitting in a large easy chair, munching jelly beans while listening to New York Yankees baseball games on his brown wooden RCA radio. Teen knew that if he really needed to speak with his father on a summer afternoon, he could find him in this room listening to the radio. In these days before air-conditioning, Fred Palm did not mind if the room got stuffy, and it did, as long as the Yankees won, and they did, dominated by Babe Ruth and Lou Gehrig from the time Teen was twelve. Fred Palm was a quiet man who usually kept to himself, preferring solitude to the often-hectic household and the strains of family life. After being struck in the eye by a nail and therefore no longer able to work as a firefighter, he began to earn a modest living as a handyman and carpenter. But “Pop,” as everyone called him, preferred to stay at home and seldom ventured out even when Susan and the children went on vacation or visited relatives. He was a tinkerer as well, and he shared his skills with his sons. By their mid-teens, Teen and Cliff were regularly and proficiently working on the family car and doing carpentry work. Susan spent most of her time in the large and sunny kitchen at the back of the house. Teen adored his mother and was often in the kitchen, seeking her counsel or just to pass time as she kneaded dough, chopped onions, peeled apples for pie, or carried steaming platters of food into the adjoining dining room. Just before each meal was served, she would dash upstairs and change into a proper dress and jewelry before taking her place at the table. She was a lady, retaining many of the qualities of a southern belle. Soft-spoken and bubbling with charm, Susan was the epitome of poise. With her soft brown eyes and palpable calm, she was adept at defusing the tensest squabbles, solving the prickliest problems. She ran the home and took care of the boarders. An excellent seamstress, she sewed clothes for the family to save money. Teen was fond of telling his childhood friends that if he ever had a million dollars, he would give her a box of Wheaties and a pile of diamonds. Susan took Teen and Gladys to Sunday school at the nearby Presbyterian Church. Susan had a beautiful singing voice and taught Teen to sing, chiding him to practice regularly, not at all reluctant to tell him when he was off key or when his timing was imprecise. At the urging of his mother, who somehow had managed to scrape up the money, Teen took saxophone lessons. He loved the instrument and became proficient so quickly that after his freshman year in high school, he and some friends formed a band that played regularly during summers at local clubs. After his high school graduation ceremony, with his diploma firmly clenched in his hand, Teen partied with his friends. He was among the most popular students in the school. Handsome and outgoing, with what many said were “Hollywood good looks,” Teen was also a talented athlete, good enough to have been offered a football scholarship to attend North Carolina State College of Agriculture and Engineering, in Raleigh, North Carolina. One summer evening, not long after graduation, Teen paid a visit to the Savoy Ice Cream parlor, where, as a freshman four years earlier, he had worked as a soda jerk. He liked serving up tasty chocolate sodas, banana splits, and sundaes to customers sitting on parlor stools and facing him directly across the shiny metallic counter. The job had not lasted long. His fondness for ice cream was his undoing and he had been sneaking too many free samples. On this night, as he sat in a booth, a few of the employees greeted him cordially and commented about his athletic scholarship. He was destined for stardom, they said. They echoed local sportswriters who had tagged him as one of the best high school players on the East Coast. One expressed the confidence that he would soon be reading of Teen’s football exploits in the major New York City newspapers. Indeed, a number of sportswriters at those papers tabbed him as the equivalent of “All State.” One friend said that he would eclipse the fame of another Mount Vernon native, Frank Carideo, who had gone on to be a star quarterback under Knute Rockne at the University of Notre Dame a few years earlier. Politely, he acknowledged the praise, and soon he was alone with his thoughts, barely paying attention to his chocolate soda while staring out the window. It was hard for him to believe that his football days in Mount Vernon were over. How had they passed so quickly? He found himself feeling vaguely unsettled. The predictions of his friends felt less like encouragement than burden. Despite his athletic success, musical talent, and good looks, Teen battled a lack of self-confidence, nagged by the thought that he might be a flop as a football player in college and compounded by fears about his weak academic skills. Would he be swallowed in the shadow of his brother who was already at North Carolina State College of Agriculture and Engineering? Might it be better for him to stay in Mount Vernon, get a job, and live with his family? He also worried about the separation from his family — not just his parents, but particularly his mother’s older sister, Nan. A second mother to him, Aunt Nan still called him “Little Boy,” a habit that began when he fell ill as a youngster and she spent many hours at his bedside. Nan’s only daughter, Marion, Teen’s older cousin, had been lured into show business years earlier, and Nan frequently urged Teen to do the same, lauding his abilities as a singer and sax player. This wasn’t empty talk. Aunt Nan knew show business. By the time Teen graduated from high school, Marion was singing and dancing in vaudeville. Marion’s husband, Frank Martine, was an accomplished saxophonist and clarinetist who played in stage shows in the 1920s and would later perform with the Big Bands led by Paul Whiteman, Fred Waring, and the Dorsey bothers. Over the years, Aunt Nan regaled Teen with stories. Marion and her husband and their two children had lived next door to Bill “Bojangles” Robinson, the great American tap dancer, and occasionally dined with the star and his family. Marion had even danced in a “Bojangles’ Revue.” Nan told Teen that when Marion and her husband had lived on Long Island, they lived next door to Louis Prima, the famous jazz-man, singer, trumpeter, and actor. They were so close that Prima’s mother babysat the couple’s two boys. Marion herself often spoke of heading to Hollywood to become a movie star. Performers peppered the family. Teen’s older sister, Gladys, worked as a legal secretary during the day and at night was a tap dancer at Proctor’s Theatre in Mount Vernon, well known for its vaudeville shows and the place where Babe Ruth had made his “singing” debut in 1921. Teen was never much of a student, never at ease in the classroom. His home was the stage — singing and playing sax. He was more than pleased that his band had a number of appearances booked in the days before he was to leave for college. But he also wondered seriously if he should forget about college and instead try to get work with local bands around Mount Vernon and, perhaps, eventually hook up with a touring Big Band. Maybe Marion’s husband could introduce him to some of his musician friends, the leaders of the bands that played at the Glen Island Casino, a popular dance club overlooking Long Island Sound. A week later, Teen was on stage singing and playing his saxophone with his band in a small New Rochelle club. Shortly after midnight, he and his friend Charles Tividy began the ten minute drive to Mount Vernon. As the car sped down Winyah Avenue, Tividy behind the wheel, the screeching of tires shattered the early morning stillness. That was followed by a booming crash as the car collided head-on with another vehicle. Tividy’s sedan was pancaked over the other vehicle, and the front ends of both cars met in a terrified mess of mangled bumpers, contorted wheels, and shattered headlights. The impact propelled Teen through the front of the car and over the hood. Fortunately, there was no glass in the windshield. He lay on the ground, bleeding but conscious, as both cars burst into flames. People streamed from their homes and some pulled Teen, Tividy, and the driver of the other car away from the burning wreckage. A passing car was hailed to take them to the nearest hospital. Gingerly, Teen was placed in the back seat of the car, and off it sped. Fighting shortness of breath and wracked with pain, Teen could only nod when the driver said he would get him medical help as quickly as possible. But incredibly, as the car sped away, it collided with another vehicle. Already experiencing pain in his chest after the first crash, Teen felt new pains attack the rest of his body. Minutes passed before he was extricated and transported in a third car to the hospital. He was rushed into surgery and emerged several hours later in a body cast. His doctor told him, “You are lucky to be alive,” and Teen understood and felt happy to be alive, and to learn that Tividy and the other driver had also survived. But he was staggered to hear he would be confined to bed for six months. The implications were obvious. He was not going to attend college in the fall. He would not be playing football. There would be no scholarship. Would he ever be able to sing or play music again? Slowly and painstakingly, drawing upon the determination that would later define his life, Teen fought his way back. When he was finally able to get free of the body cast, he was physically weak. But he was able to focus on and find great solace and hope in his music, practicing his saxophone and his repertoire of songs. And a year after the accident, he was once again going out regularly to dance and listen to music. But despite his successful recovery, he felt adrift, his future uncertain. Money was tight at home. His father was finding fewer and fewer carpentry jobs. Teen considered seeking a full-time job so he could contribute to the economic support of his family. But what job? Then, one hot summer day in 1933, the phone rang at the Palm household. The caller identified himself as Jimmy Poyner. He said he had met Cliff, Teen’s older brother, while both were attending North Carolina State College. Poyner said he was putting together a band with other students from that college, Duke University, and the University of North Carolina. “And we’re calling ourselves the ‘Southern Pines Orchestra,’” Poyner said. Teen was stunned. Sargent was his idea of the perfect ballad singer. Poyner paused, awaiting a response. But Teen was too stunned to speak. Dazed, Teen hung up the phone. As he tried to process what he had just heard, his mind was a wild swirl of questions: Could this be his big show business break? What if he failed? Could he make enough money as a musician to pay for his education now that his football scholarship was gone? What if he failed? Would his mother and father believe him a fool for trying to go to school and play in a band at the same time? What if he failed? What if he failed? What if he failed? These thoughts, these worries, these questions dogged him for days and were still with him a week later when he walked into the Glen Island Casino. The dance floor, which could accommodate up to one thousand eight hundred people, was packed. Built in 1930, the casino had become one of the premier entertainment centers on the East Coast, with performances broadcast on radio to increasingly large audiences. Many of the great entertainers of the day performed here: the Dorsey brothers, Benny Goodman, Ozzie Nelson and his band, and on this night Glen Gray and the Casa Loma Orchestra, featuring the golden-throated Sargent. As couples glided across the dance floor, others dined on white-linen-topped tables. With the last notes of “Doing the New York,” the lights around the large dance floor dimmed. Sargent took his place underneath a spotlight and behind a microphone on the white riser bordering the dance floor. A minor stampede of dancers, including Teen, rushed toward the stage. Sargent, dark-haired and handsome, ended the band’s set with “Under a Blanket of Blue,” and as the crowd broke into wild applause, Teen stepped off the dance floor and moved toward the open doors at the edge of the hall. He walked outside and looked up to see that thick clouds had rolled in, partially covering the moon. The breeze had strengthened, bringing a chill to the air. He could smell the sea and hear the lapping of waves on the beach below. He sat down on a plain park bench. Enveloped by the darkness and the quiet, he took a deep breath, and made his decision.